Share "Does Your Cat Have Ear Mites?" Ear mites can be uncomfortable, even painful, for your cat, and recognizing the signs of ear mites is essential so you can get your feline friend the proper treatment to eliminate these irritating parasites. Without treatment, infestations can become severe and cause permanent damage, but fortunately, ear mites are easily treatable when they are correctly diagnosed. Ear mites, Otodectes cynotis, are tiny parasites that feed on the tissues, wax, oils and blood in a cat’s ear. While these mites can be seen with the naked eye, they are generally only the size of a pinhead or even smaller, and visual confirmation can be difficult depending on how sensitive the cat is and how severe the infestation may be. These highly contagious mites are most common on kittens and outdoor cats, but can also infest other pets, including dogs, rabbits, hamsters and other small animals. In addition to living in the animals’ ears, these mites can life on the fur, skin and paws of pets, which allows them to spread even more easily if they are not promptly treated. While most symptoms are mild, a severe, untreated infestation of ear mites can lead to more severe symptoms. 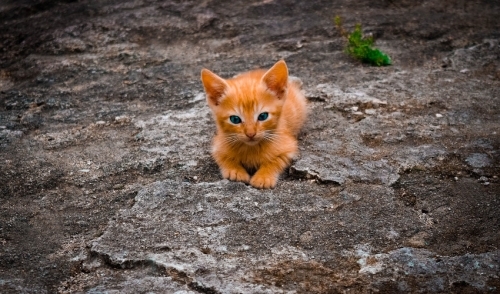 A cat that is very sensitive may also show stronger symptoms even if the infestation is mild. It is important to note, however, that other conditions, including allergies, fleas, yeast infections and some types of tumors, can show very similar symptoms. If you suspect your cat has ear mites, it is best to visit a veterinarian right away from a confirmed diagnosis and appropriate treatment. If medication is administered to treat the infestation, a typical course of treatment will run 7-10 days. In severe cases, however, treatment may continue for two weeks or longer, and it is important to complete the entire treatment period to ensure the mites are eliminated and do not return. A follow-up vet visit will ensure the cat’s ears are mite-free. In addition to treating ear mite infestations, there are easy ways cat owners can prevent their pets from attracting these parasites. Regularly cleaning the ears and keeping alert to any possible problems will minimize infestations, and pets’ bedding and toys should be cleaned regularly. Keeping cats indoors will also minimize the risk of ear mites, as they can easily attract these pests if they come into contact with other outdoor pets or wildlife. Ear mites can be a nuisance, but recognizing and treating these pests is fairly easy and your cat can be comfortable and mite-free without trouble. © 2019 Alpha-Dog Pet Centers, LLC.. All rights reserved.